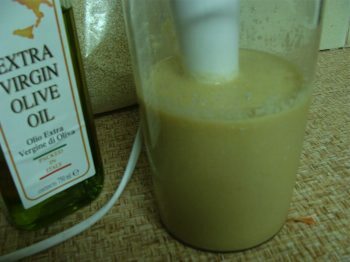 How to make tahini suggests all you need is sesame seeds and olive oil; make your own sesame seed paste. So, what is it? If you're anything like me, five years ago you'd never heard of it, and now want it daily in your diet. Rather like peanut butter, it's a paste made from sesame seeds. 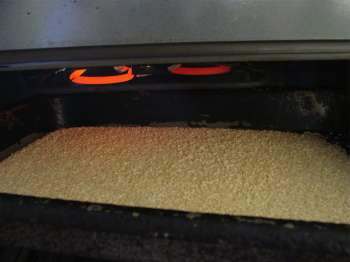 They are traditionally lightly roasted and then crushed, making a super smooth tahini paste. You can very simply make your own tahini at home, with a little improvisation. 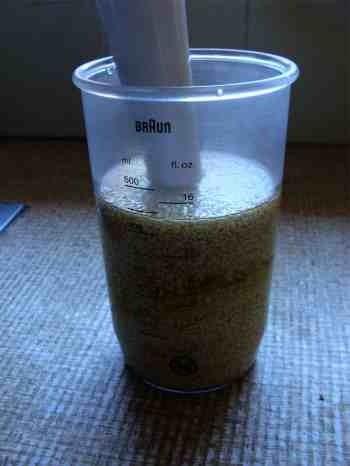 Since you almost certainly won't have a sesame seed grinder, a hand held blender does the job very well. Why grind or blend your sesame seeds? Because, unless you practise fletcherising, chewing every mouthful 32 times, they will pass right through your alimentary canal undigested. So the shell must be cracked to get at the important fatty acids and protein in the seeds. It's best to cheat. 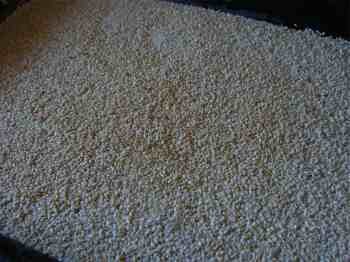 Since virtually all recipes that use tahini also use olive oil, I add olive oil to the sesame seeds before blending. True, it's not real tahini, but both nutritionally, and taste wise you won't be able to tell the difference. Otherwise you have to buy solvent extracted sesame oil; not good. This page was last updated by Dr Barrie Lewis on 21st December, 2018. 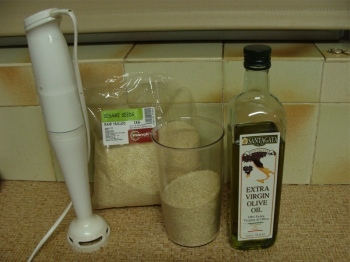 How to make tahini and It takes is no more than five minutes to make your own sesame seed paste using a simple coffee grinder. When I left the Netherlands for my native South Africa, one thing I dreaded. Would I be able to get tahini, or tahin as the Turks in Rotterdam call it. Seven years ago I had never heard of tahini. By the time we left Holland tahini paste had become a staple in our diet. Helen and I simply could not imagine going without tahini. Well, in one respect I could relax. A Greek shop sold tahini, but at a price! So my son and I put our heads together: couldn't we make tahini? At home? Well, yes, we could. For three minutes' work, we made up a recipe for tahini, costing one tenth of the price of the Greek shop tahini. There are two kinds of tahini: raw and roasted sesame seeds. I recommend you try both ways. 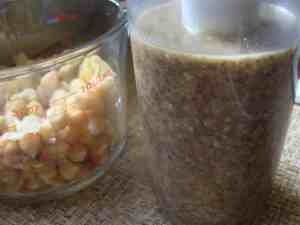 They are both delic and VERY healthy; in short, make your own tahini. This is the easier way to make your own tahini. Simply take about a cup of raw sesame seeds, add about half a cup of olive oil and blend. What could be easier? Two minutes. Since your blender and mixing bowl are already sticky, go right ahead and make our authentic hummus recipe; it takes only a further four minutes, I'm not kidding, to make your own hummus right in your own kitchen. Update: I now have a dedicated coffee grinder (cheap from Amazon) for sesame and flax seeds. It makes the paste even smoother and nicer. 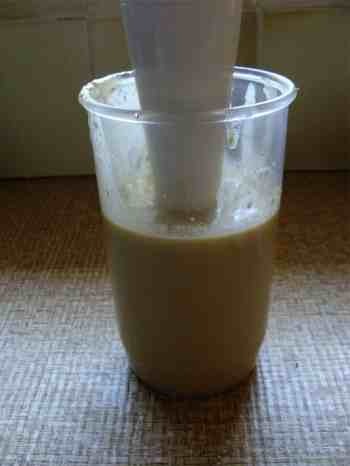 Scrape the raw tahini paste into a bottle and refrigerate. Otherwise it will oxidise (spoil) quite quickly. The very important essential fatty acids, and especially the amino acid methionine which tahini is rich in, are prone to going off (rancid) unless chilled. If the bottle isn't full, cover your tahini with a little olive oil to seal out any oxygen. So, wasn't that simple? How to make tahini is kid's play. The only difficulty you might have is finding bulk sesame seeds. Keep them in the freezer by the way. Traditionally in the Mediterranean countries, tahini is made from lightly roasted sesame seeds. Personally, I'm still trying to make up my mind if it's better, but simply because they've been making it that way for centuries, it probably is. 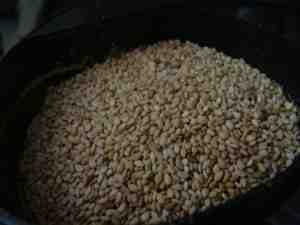 First take your sesame seeds and spread them in a roasting pan; perhaps half an inch deep. 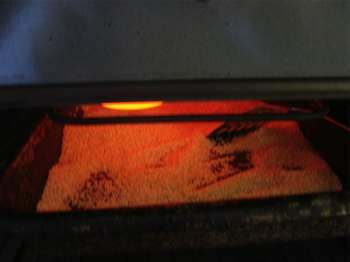 Place the roasting pan under a hot grill, stirring and shaking regularly; they burn very easily. Sesame seeds are particularly rich in two amino acids that are absent in most legumes; methionine and tryptophan are vital for good health. So there are many Mediterranean recipes that blend tahini and chickpeas, for example. Perfect! Lightly roasted, a perfect light brown tinge... don't burn them. Update: This is where you would now put the toasted sesame seeds into your coffee grinder. 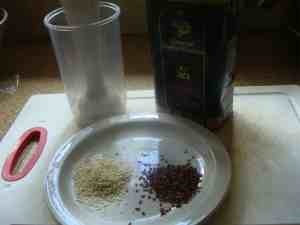 Now add your olive oil, not too much because the seeds are very oily... and blend. And here your final product, a rich and creamy smooth sesame seed paste, delicious on bread, with a salad, in hummus and baba ghanoush... and a host of other delicacies. Rich in the essential very healthy essential mono-unsaturated fatty acids without which your nerves can't conduct normally, high in essential amino acids, rich in iron and calcium, high in phytosterols, those substances that prevent cancer... and cheap! Pure nutrient food, zero cholesterol, what more do you want!??? Use your tahini now to make your own chickpea garbanzo bean dip and perhaps this delic eggplant BABA GHANOUSH. You can make these side dishes in under ten minutes. Dinkum. Have your guests guessing... once I've made the blender sticky, now that I know how to make tahini, I find I might as well go on, and make another of these sesame tahini dishes. My lunch today, and two slices of whole wheat bread. Now you know why my cholesterol is "dangerously low"! And why I could enjoy a thick slab of butter on that bread with not the slightest guilt feelings. 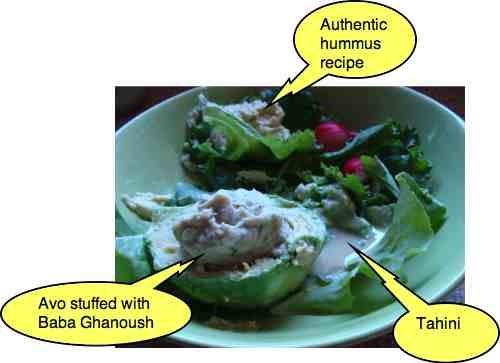 Aside: Some folk are concerned that tahini and hummus and avocado and the like are all very fattening. Not too worry. Research shows that those eating a diet like this, rich in fibre actually lose weight. The problem with weight gain is usually too much starch, not too much of the healthy oils in these foods. Remember, every nerve is coated with fat. Without its myelin sheath researchers in the Netherlands and Japan are finding folk are more prone to the nasty neurological diseases. Because of its cholesterol lowering properties and delicious flavour, I use eggplant in as many different dishes as possible. Recipes with tahini abound, but baba ghanoush is certainly one of my favourites. 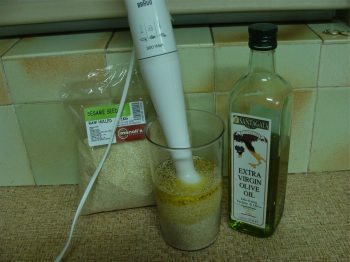 Right, now you too know how to make tahini; all you need is sesame seeds and olive oil and fifteen minutes; go for it. Try to avoid the health food stores when buying sesame seeds. They break them down into small packets at double the price. 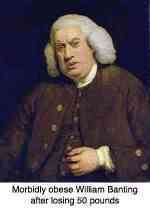 I purchase a kilogram at a time; two pounds. Look perhaps for a Chinese, or Lebanese, Greek or Turkish shop. It was not written in the immutable Laws of the Medes and Persians that hummus may be made only with Sesame seeds. I'm always looking for simple ways to eat more healthily rather than being true to tradition. It's now widely accepted and scientifically proved that we ingest far too little omega-3 fatty acids. The are two abundant sources: fish oil and flax seed. 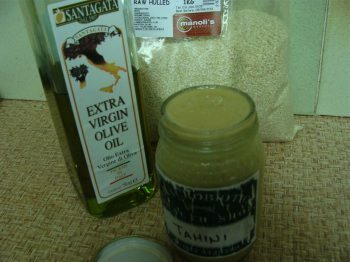 Here's my Flax-sesame-tahini recipe. Very simple. It's perfect for making an enriched hummus. Spoon out any amount into your blender bowl. Don't be stingy with the olive oil. Simply blend. What could be simpler? 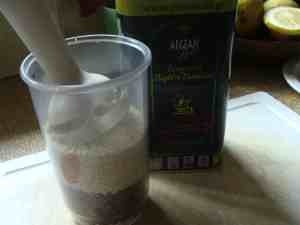 Here is our sesame and flax tahini, just ready to go into chickpeas to make delicious hummus. Honest injun! Flax seeds are tougher than sesame seeds. I need a better grinder to turn the seeds into a paste. Something for the future, perhaps a coffee grinder. Healthy choice foods is fundamental to better health. If you're eating crap, excuse the French but I feel strongly about it, then all the chiropractic in the world cannot give you healthy joints. Healthy choice foods are for those who don't like pain, and don't want to have a heart attack or stroke long before their time. Chiropractic adjustments can set your joints moving freely, which is vital for replenishment of the synovial fluid that bathes the hyaline cartilage, but if that liquid doesn't have enough oxygen and the right nutrients then it will decay, no matter how many manipulations you have. If you are suffering from chronic joint pain that doesn't seem to respond to anything, then think about more exercise and our healthy living tips. If you're enjoying chiropractic help, then you're not all alone. In January 2016 for the first time over half a million pages were read.